Whether you’re building a brand new home and finishing it with a beautiful outdoor deck, or adding onto your existing property, it isn’t hard to see why decks are an integral element in an inviting home space. From dinner parties to relaxing in the sunshine to swimming in your nearby pool: decking serves many purposes and adds an element of fun and sophistication to your home. Decks adjoining your home serve as a wonderful union between the natural world and the architecture of your home. Today’s trends in modern decking see a return to organic materials and styles that highlight naturally occurring features. These spaces are perfect integrations between home and the outdoors and add value and beauty to your home. If you’re planning to have a new deck built on your property, here are a few things to consider to help you end up with the best possible result. What is the purpose of your deck? It may seem obvious, but you should give serious consideration to your plans for your deck before embarking on a build. The ultimate purpose of the decking will direct the design, materials used, and even the placement of the structure. Do you plan to use your deck to welcome guests or host events? This will demand different considerations than a deck designed for more intimate gatherings. Do you intend to incorporate a spa or a pool, either now or in the future? Your deck may need to be constructed in a way that supports this. How often will the deck be used? At the same time, consider the frequency with which the deck will be used. Constant, every day use will necessitate a heartier construction: a finish that can withstand wear and tear, more seating incorporated for family and guests, etc. The purpose and frequency of deck usage will also influence where you ultimately decide to install it. You may want a deck to be located immediately adjacent to your home for ease of use and entertaining, or you may be after a more secluded, private location set at some distance away. The final location may be dependent on availability of sunlight, orientation, or other unavoidable factors. Do you have specific design goals for your deck? The fun part of planning your deck build is the design. Your Launceston builders at Krause Construction are ready and excited to help you during this phase, as we turn your vision into a tangible creation. There are nearly endless possibilities when it comes to deck design. Incorporating the existing landscape is always a welcome challenge, and one that can make your deck really stand out as an impressive piece (think a deck built around a sturdy tree that serves as a shady focal point for your outdoor area). Or if you are seeking a distinctive look or “theme” we can advise on ways to enhance this stylistically. What timber options do you prefer? Homeowners tend to have strong opinions on the timber they enjoy. Whether you like a rich cherry or a lighter treated pine, a variety of wood options are well suited to your outdoor decking. If you’d prefer, alternative materials can be used as well, sometimes saving money or helping to create a specific look. There are many beautiful Australian woods to select from for your deck, and we can help you sort through the various options. Your final choice will depend upon your budget and your decorative preferences. Finally, you should consider your budget. While the right contractor will always work with you to achieve the best results for your budget, it is important to know the financial limits from the start. If budget is a factor, you may wish to speak with your builder about more cost-effective materials. Hardwoods, for instance, tend to be more expensive than other types of timber or than prefabricated composite decking. Your budget will limit your choices somewhat, but there is still so much that can be achieved for your deck. Ready to make your dream deck a reality? 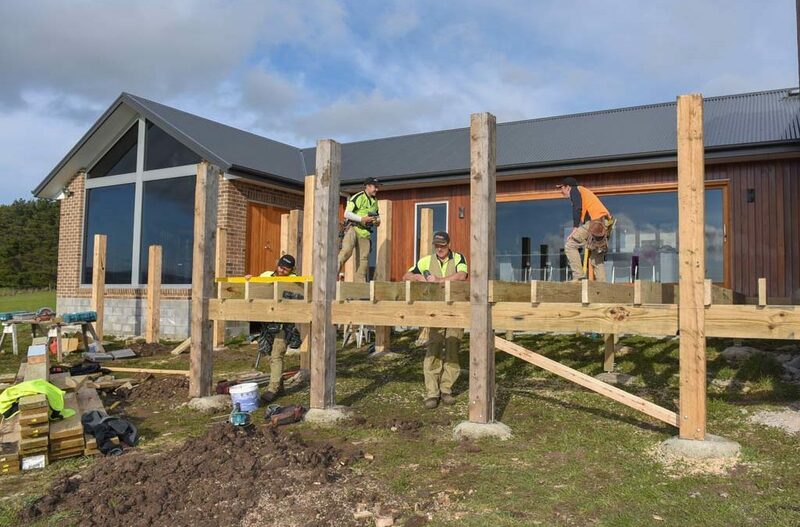 Krause Construction are your trusted Launceston builders. We specialise in new home builds and renovations, including the planning and construction of decks and pergolas. We’d love to help create a stunning new addition to your property.